It's a stupid name. Who is John? And why does he have a unicorn? It has a garish frontage, of large bold type with pink and teal signage, sticking out like a sore thumb on Peckham High Street. It's an Antic-owned pub, and by and large I've been a fan of them as they make a real effort to make each different from the other. This particular one is shabby chic inside, obviously decorated with unicorns, and it's absolutely cavernous. A huge downstairs bar / pub area and a garden is augmented with an upstairs restaurant. Despite its flaws (John. The. Unicorn.) the food is really very good. 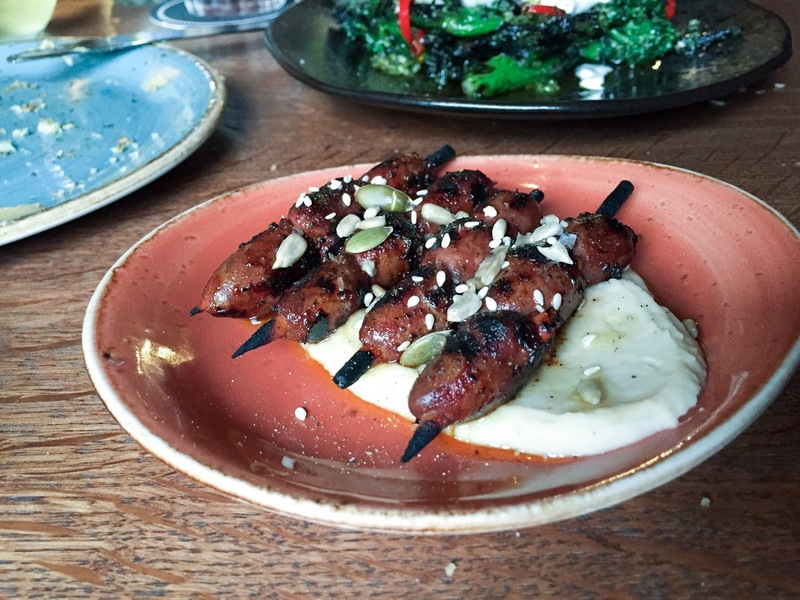 Head Chef Ben Mulock spent several years at The Opera Tavern, so naturally the food has a vaguely Spanish slant. 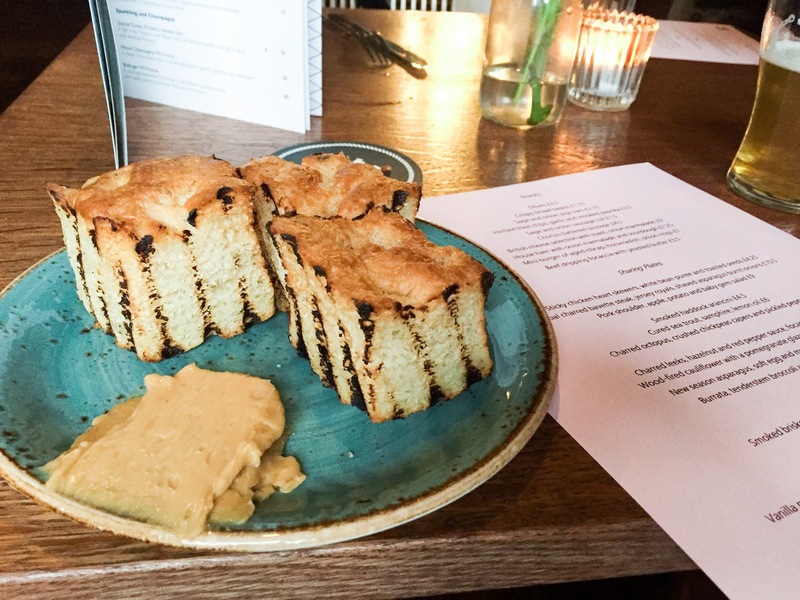 Grilled cubes of light bread, served with a yeasted butter were smoky and airy, the butter giving off that mouth-wateringly savoury flavour that I love Marmite for. Chicken heart skewers were pink and juicy, on a bed of smooth white bean pureé, and ridiculously good value for £4.25. Nuggets of beef brisket were crispy and atomically hot within, topped with a pickled red onion. 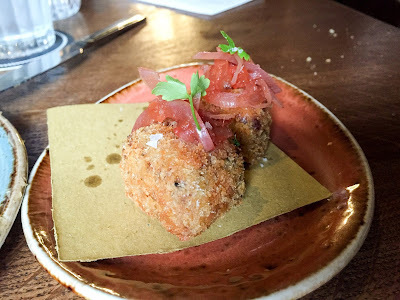 The menu changes every so often, and while these aren't available anymore, I imagine their replacement, smoked haddock arancini, are just as good. 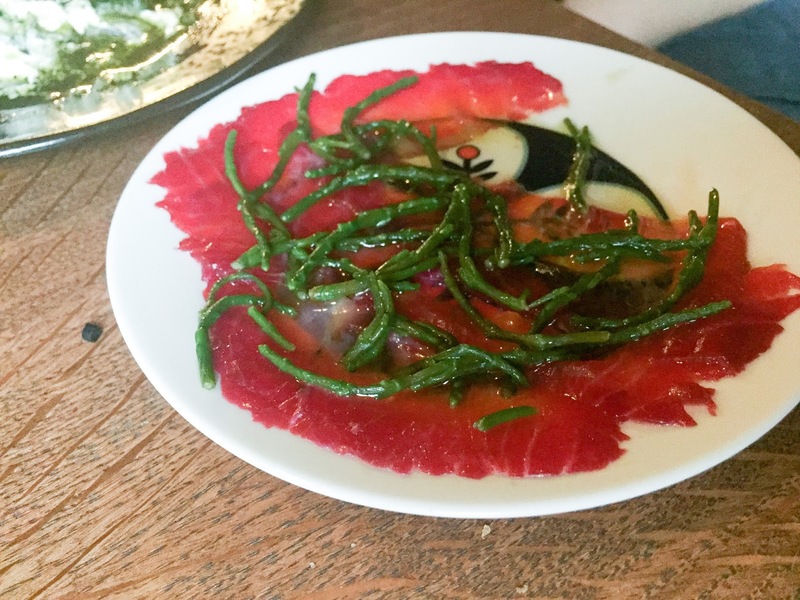 Cured trout with samphire was slightly less successful; it tasted like the fish was ever-so-slightly over-cured, so the texture was hardened. The samphire gave a good seafood flavour, but overall it needed more citrus. We bored of this quickly, though it was pretty. 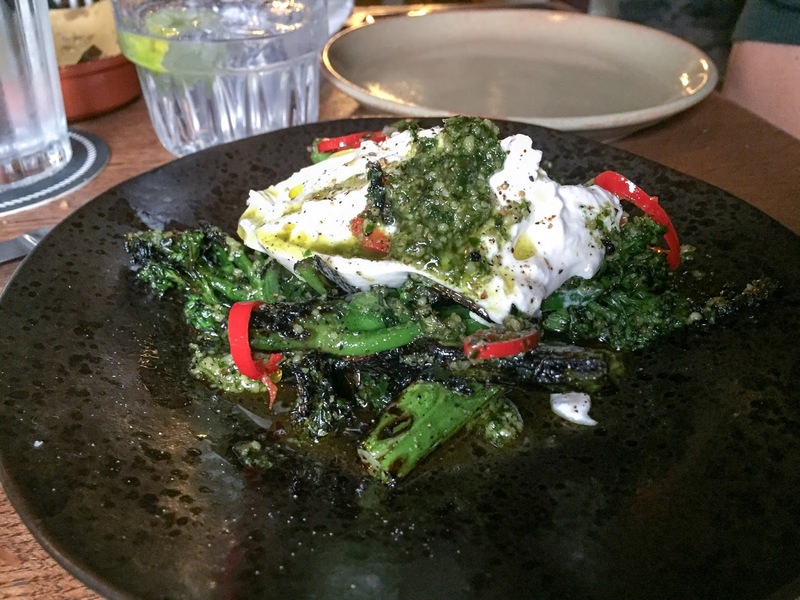 We were back on track with burrata served with char-grilled tenderstem broccoli, pesto and chilli. I often think burrata is just fine drizzled with a fruity olive oil, but this was a worthwhile addition too. That creamy, dreamy cheese. 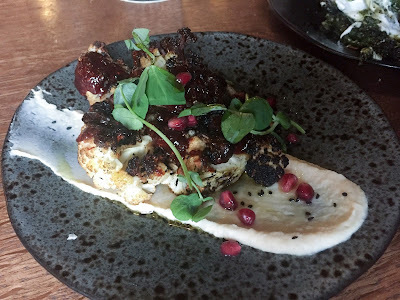 My favourite dish of the evening was the wood-fired cauliflower with pomegranate dressing; I often have cauliflower roasted with houmous and I find the whole thing can get a bit claggy, but this bean pureé was a lot lighter, creamier and all the more balanced. The pomegranate added a sweet tartness, detracting from the fire and smoke flavour. I loved this. 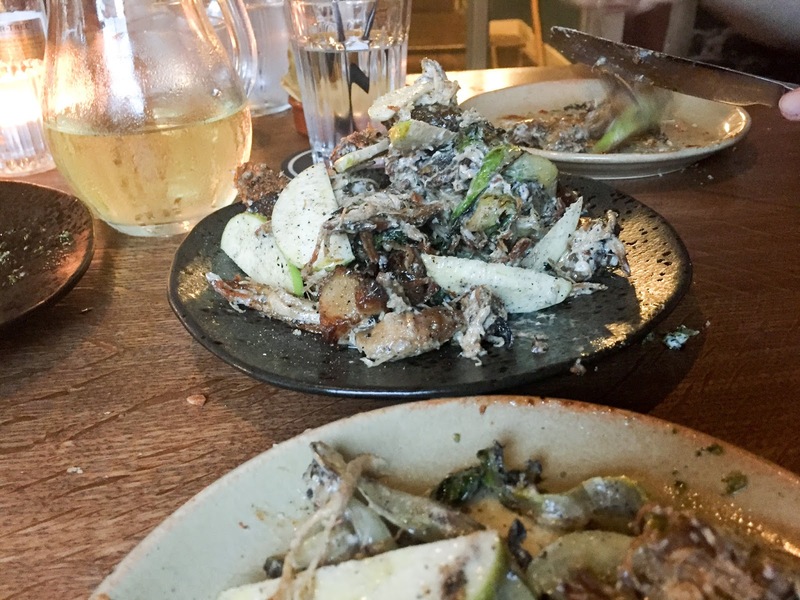 I didn't love the roasted pork shoulder, the only 'main' we ordered. Served with sliced granny smith apples and roasted, crisp new potatoes, it would have been great had it not been so salty. I couldn't take it, though I did ask for it to be packaged up for me to take home, as reheated with a bland carb (I had it with rice and chilli sauce) diluted the saltiness. All the components of a great dish were there, I just wondered if there was some sort of mistake with the seasoning. Desserts were decent; I enjoyed my pannacotta with wild strawberries, but its the cauliflower I'll be going back for. Full disclosure; we had our bill comped, but that was very much to our surprise and we didn't know this when we ordered. All opinions are obviously my own and unfettered. Some interesting ideas, a shame they didn't all work!